Updated iOS App: What's New? We have updated our iOS app experience with improved design and usability, as well as some new functionality. Here are a few of the changes you can look forward to. We’ve added a few new features to expand what you can do with forms on your iOS device. 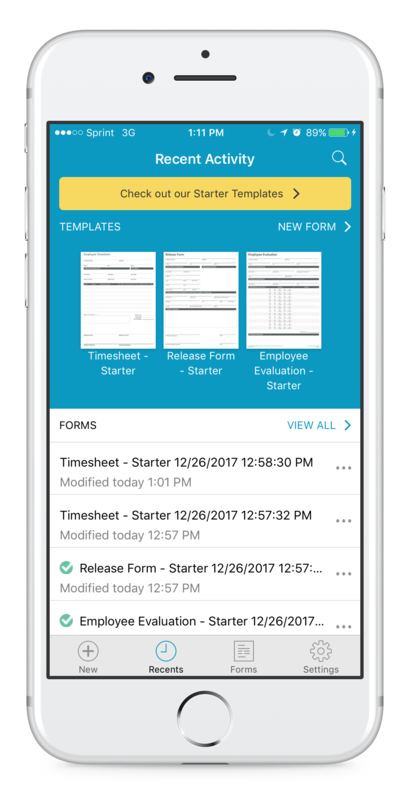 Form sharing: The new Share action leverages your device’s native functionality and apps to make it easier to share, email, print, and download forms. This replaces the Email and Download PDF actions from previous versions. Streamlined navigation: We’ve replaced the old dashboard and menu with a navigation bar at the bottom of every screen. The new nav bar provides access to your primary tasks, making it easier to find what you are looking for. Faster form creation: The form creation flow is more intuitive than ever. To create a new form, simply tap the plus icon in the new navigation bar and choose a template. Intuitive design: The UI has been updated for a more modern look-and-feel, and to make all functionality more easily findable. For example, the Sync button is now readily available in the Settings screen, and the new Form Actions menu makes it easier to transfer, share and copy forms. Check out the iOS App User Guide for documentation of the updated app, including all new functionality and up-to-date screenshots.